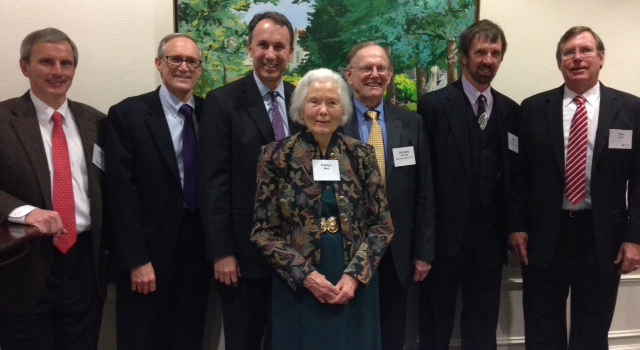 Evelyn Ward, wife of the late Judge Hiram H. Ward, gathered with some of her husband's former clerks at a reception at Kilpatrick Townsend in December 2014 celebrating the extraordinary influence of Judge Ward, who exemplified the principles of Pro Humanitate throughout his life. In the 30 years he sat on North Carolina’s Middle District Court bench, Judge Hiram H. Ward (JD ’50) was known as a principled man who respected the law, as much as he did the broad swath of humanity that came through his courtroom. But to a generation of Wake Forest Law students, Ward was also a mentor, friend and father figure, who eased the transition from law school into law practice. Aspiring clerks from all over the country applied for positions with Judge Ward. His widow, Evelyn Ward, said her husband found that graduates of the law school worked best. “He needed good writers and good strong analytical minds that could ferret out all various aspects and complexities that go into hearing a case,” Evelyn Ward said. Judge Ward served North Carolina’s Middle District Court from 1972 until 2002, when he died at the age of 79. The life of a federal judge could often be a lonely one, Evelyn Ward said, and her husband treated his clerks like extended family members. On the weekends, Judge Ward liked nothing more than adjourning to his 200-acre family farm in Denton for a weekend of hunting and fishing. “When we’d go home on Friday afternoons, within 15 minutes, he would have changed his clothes and he’d bring back our supper from the pond,” Evelyn Ward said. His clerks often joined the Wards at their farm for “pond parties” that featured barbecues and walks through the woods. Even after their clerkships ended, the Wards welcomed the former clerks, and eventually their families, back for parties. Steve Berlin (’81, JD ’84) served as a clerk for Judge Ward from 1984 to 1986. Berlin is now a partner at the firm of Kilpatrick, Townsend & Stockton. His perspective as a judge helped his clerks understand how to be more effective lawyers and he took his responsibilities as a mentor seriously. 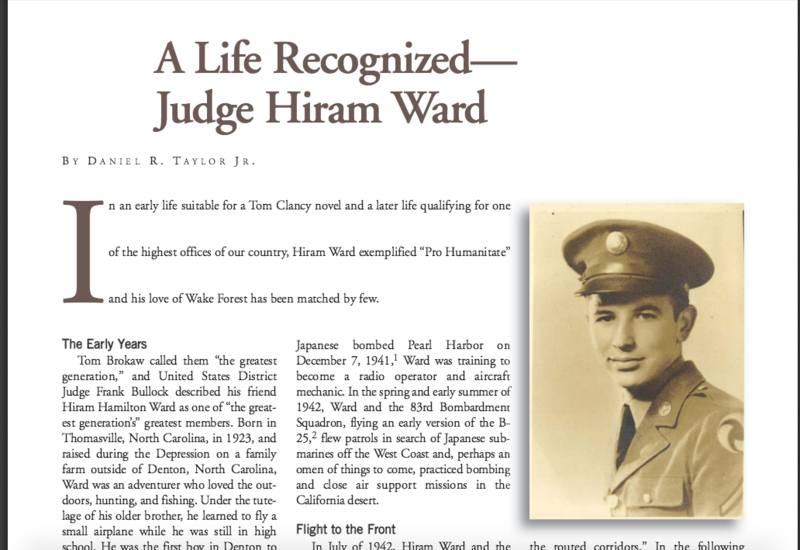 Judge Ward enlisted in the U.S. Army Air Force during World War II and rose to the rank of Master Sergeant. He served in Europe, North Africa and Burma, where his plane was shot down. After graduation from law school, he practiced law in Denton and Lexington until 1972, when he was appointed to the U.S. District Court. In 1999, the federal building in Winston-Salem was named in his honor. Serving as a clerk for Judge Ward was a chance to see a lot of different lawyers in action and to understand a judge’s thought process, Bennett said. Judge Ward was not a fan of flowery language and flowing rhetoric. “He wanted to be sure that the people who came before him were treated the same, whether they had overalls on or were dressed in fine Italian suits,” he said. Dan Taylor (JD ’76), a partner at Kilpatrick Townsend, clerked for Judge Ward from September 1976 through August 1978. Taylor wrote an essay about Judge Ward, which was published by the North Carolina Bar Association in summer 2014 below. You can read the full article here.